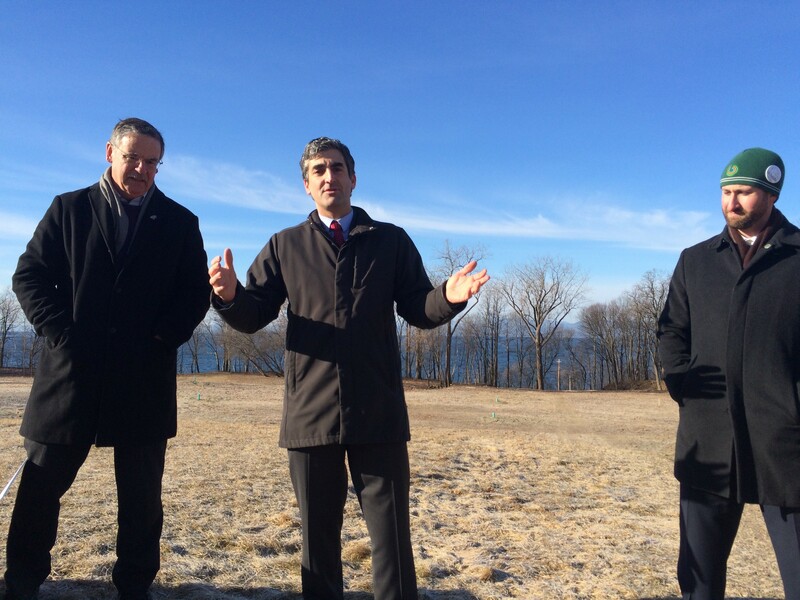 From left, Vermont Land Trust president Gil Livingston, Mayor Miro Weinberger and Parks, Recreation & Waterfront Director Jesse Bridges stand in front of the future parkland. Burlington and the Vermont Land Trust on Thursday purchased 12 acres from developer Eric Farrell for $2 million. The former Burlington College land, which borders Lake Champlain, has been the subject of a contentious debate about conservation since the cash-strapped school sold it. Last December, city officials reached an agreement with Farrell to preserve nearly half the land. The remainder is expected to host a housing development with roughly 700 units. Calling Thursday’s acquisition a “very critical milestone,” Mayor Miro Weinberger also acknowledged that it won’t be final until the city approves several zoning changes requested by Farrell. Paving the way for the deal, the city council voted on Tuesday to use $500,000 from the city’s Conservation Legacy Fund for the purchase. The Vermont Land Trust secured a loan to cover the rest. Land Trust president Gil Livingston said Friday that the trust plans to repay that loan through a Vermont Housing & Conservation Board grant of roughly $400,000, a federal grant of at least $100,000 and philanthropic contributions. The city has also agreed to pitch in up to an additional $500,000 from the Conservation Legacy Fund, a possibility the mayor said was likely. The people responsible for the deal remain adamant that it's a triumph for the city — protecting open space that was previously privately owned, while also allowing much-needed housing. However, some people remain highly critical of the deal, arguing that a 12-acre park is no replacement for the current “urban wild” that exists on the property.